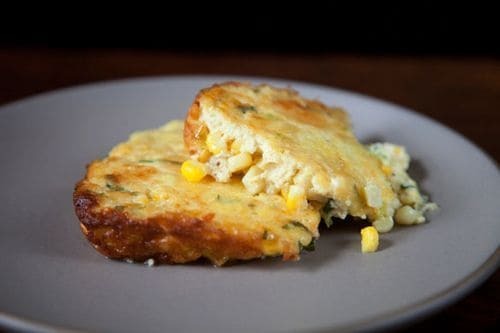 My summer corn pudding was a finalist in a recipe contest on food52 a few years ago. The challenge was “Your Best Corn Off the Cob”, if I remember correctly. 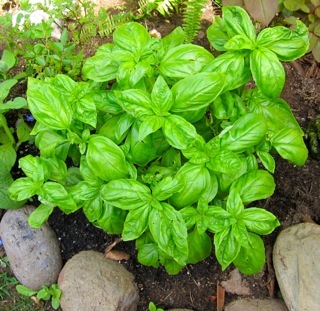 I always have fresh basil growing in the garden this time of the year, but you could easily substitute fresh dill or even flat-leaved parsley. I had kind of forgotten about this recipe and recently pulled it out to go on the menu for our Labor Day gathering, just around the corner. LtC tip: this recipe can easily be doubled for a crowd by using a 9 X 13 baking dish for 50 minutes. A simple corn pudding using fresh corn. Using a large skillet, melt the butter over medium heat. Add the corn and scallions and cook for 3 minutes. Remove from heat. In a large bowl, beat the eggs slightly. Add the honey, flour, milk and cayenne. Whisk to mix well. Add the corn-scallion mixture and the ⅓ cup grated cheddar. Add salt and pepper. Mix well. Roll the basil leaves into a little cigar, slice thinly and add to pudding. Stir. Pour the pudding into a square, greased baking dish or similar size gratin pan. Sprinkle top with reserved 2 Tablespoons cheddar. Bake 40 minutes. Allow pudding to rest 15 minutes before serving. This looks so delish Liz, another keeper for me! Thanks, Wendy – have a fun time with Jayne. I think she flew out of London this morning . Where are you going? We are off to the Bay Area this weekend. I’ve never made corn pudding – now I will try with this recipe. I remember this recipe Liz. It sounds so good and I think it will be great at your labor day gathering. I have never made corn pudding before, it really does sound delicious,. It’s a nice side dish for summer dinner parties. Hi Liz! I love finding old recipes, especially ones like this. I was just eyeing the fresh corn at the store, and I also but extra. This recipe is just want I need. I just made this tonight for my parents and we all loved it. My favorite response – my folks would have loved it as well, Cathy – thank you for your enthusiasm. Liz, I don’t do enough with fresh corn. Must try this lovely dish very soon! It’s such a great summer recipe during corn season – hope you try it.